WELCOME TO THE LETTERPRESS SHOP. We really are good old fashioned commercial letterpress printers. So every job is custom-produced from your artwork and specifications. However, in an effort to get along in the modern world, we’ve prepared a basic selection of services available for online ordering. 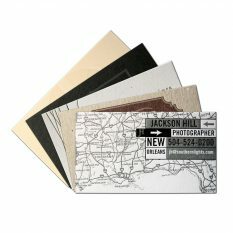 Currently, custom letterpress business card printing can be ordered online in several paper stock ranges. Or, for those looking to get their Custom Inspector Stamps, you’ve stumbled upon the right place and can order yours below. Online ordering is the best method to get your hands on a stamp. More online products & services coming soon. As always, custom quotes and rigorous service are the norm. Of course the world was never meant to be run by computers and custom quotes and personal service never go out of style. Phone 330-337-3341 to discuss your project. Alternatively, the old man does use email. Your project specs can be sent here. We will prepare a quote and get back to you forthwith. Date finished project is needed. List of all the separate items that need to be produced, such as business cards, die-cut coasters, invitation sets, etc. A brief description of the job to be quoted. List other services such as bindery work, custom duplexing, edging, folding, etc. that are needed. Specify the number of ink and/or foil colors to be quoted. Specify the number of in and/or foil colors to be quoted. Enter 0 if the back is to be blank. List paper choices to be quoted or a rough description of what you have in mind. Size of the finished pieces. List any other quantities you would like quoted. Is there any other information you'd like to include?